I trust your holidays were blessed and you are enjoying the gift of a new year. A couple of posts back, I started a “salt series”. This entry will round off that series by exploring why we need (more) salt in our lives. While, I am not into resolutions, I think this may be a good area for all saved folks to gain more knowledge and strength in, myself included. Let’s dig in! “You are the salt of the earth; but if the salt loses its flavor, how shall it be seasoned? It is then good for nothing but to be thrown out and trampled underfoot by men” (Matthew 5:13 NKJV). Salt gets a bad rap because of its link to high blood pressure, fluid retention, etc. While anything in excess can be harmful, iodized salt is not the best for the body. 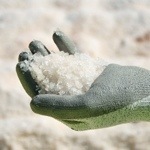 Common “table” salt is void of vital nutrients except iodine, which is added back after processing. And that’s just the a small fraction of what salt does! Just as its needed in your body, it’s needed in the Body Of Christ as well. Salt regulates the “Body” by keeping “infections” out such as: idolatry, witchcraft, hatred, variance, emulations, wrath, strife, seditions, heresies, envyings, murders, drunkenness, revellings, and things like this. Willful engagement of these behaviors will prohibit us from entering into the kingdom of God, according to Galatians 5:20-21. Having salt on the regular will keeps us functioning and keep the “good” in. Love, joy, peace, patience, kindness, goodness, faithfulness, gentleness, and self-control. There is no law against these things! (Galatians 5:22, 23 NLT). Salt “preserves” us from practicing sin. We also need salt for our conversations with family, friends, co-workers and the not-so-nice store clerk. Let your speech always be with grace, seasoned with salt, that you may know how you ought to answer every one (Colossians 4:6 NKJV). Another example comes from Proverbs 15:1–a soft answer turns away wrath, but grevious words stir up anger. Salt helps temper your responses. Few things are as bad as a flavorless, or what I call a peppered Christian—acting bitter and nasty due to hurt, cares of the world, practicing sin or bad habits. In fact, let’s go back to the verse that started the series–Matthew 5:13 “You are the salt of the earth; but if the salt loses its flavor, how shall it be seasoned? It is then good for nothing but to be thrown out and trampled underfoot by men. You see, in the Bible days, when harvesting the salt, if any of it was contaminated with dirt or marsh, it was put on the dirt roads to keep the dust down, hence the reference to being trampled underfoot by men. A contaminated Christian NOT the testimony we want. We have to stay seasoned in order to draw the world AND love folks. Jesus said,“have salt in yourselves and peace with one another” (Mark 9:50). If there is no salt in you, you will not have peace with others. Makes a lot of sense, doesn’t it? Bottom line: Salt is a necessary nutrient needed in our natural and spiritual lives. Adequate salt intake comes from prayer, fasting, regular bible study and attending church. Also, just like when we season our food, we want to use the correct amount of salt in our speech and actions. Too little salt is not effective—too much salt and is not palatable. Rather than trying to keep impossible resolutions this year, let us covenant with the Lord that with His help, we will always use/the right amount of salt in ALL our interactions. Amen? Amen! God’s best blessings to you! Hey Jacque! Thanks for stopping by and commenting! God bless you!! !